Efficient and reliable monitoring of low concentrations of various impurities in pure water treatment is critical for microelectronics and power cycle chemistry applications. METTLER TOLEDO offers a series of sodium, silica and chloride/Sulfate Analyzers that use industry-proven technology with innovative approaches to provide assurance of water purity to minimize corrosion while maximizing water production. What is a sodium analyzer? A sodium analyzer is an on-line measurement system to ensure that water is not contaminated with sodium, which can be corrosive and damaging in processes that require pure or ultrapure water. They are often used in power plants for monitoring water cycle chemistry or in microelectronics manufacturing. Fully automatic, online systems such as the 2300Na Sodium Analyzer can monitor at sub-ppb sodium levels. I measure conductivity, why should I measure sodium? Sodium should generally be measured in addition to conductivity. Because conductivity is non-specific, it cannot distinguish between contaminants and water treatment chemicals such as ammonia or phosphates. A sodium analyzer is more specific and more sensitive. It can detect when a cation exchanger needs to be regenerated, whereas conductivity cannot "see" the sodium until the levels are too high because of the high background conductivity of pure water. The sensitivity of a sodium analyzer is critical, because contaminants in steam become many orders of magnitude more concentrated when they accumulate in the first condensation droplets in turbines, where they are very corrosive. How does a sodium analyzer work? The analyzer uses an ion-selective electrode designed to specifically measure sodium in the water. The sample water is treated with a reagent to suppress interference from all other ions in the water, and the electrode measures the sodium concentration in the water as it flows by in a continuous stream. With fully automatic calibration, the analyzer undergoes periodic calibration to ensure the measurements are always accurate and reliable. What is a silica analyzer? How does a silica analyzer work? Silica content analysis is a batch measurement, where sample water is taken in the analyzer and a set of reagents added to react with the silica in it. The sample water turns blue at the end of the reaction, with the intensity of color depending on the concentration of silica – the more the silica, the darker the blue color. The analyzer detects this change in color and calculates the silica level in the water. With fully automatic calibration, the analyzer undergoes periodic calibration to ensure the measurements are always accurate and reliable. What is a chloride and sulfate analyzer? A chloride and sulfate analyzer is an on-line measurement system that uses microfluidic capillary electrophoresis as a method for detecting chloride and sulfate ions at very low ppb limits. It is designed to support power production facilities in achieving their cycle chemistry guidelines and meeting their turbine warranty requirements. It achieves trace-level measurements not possible with typical ion-selective chloride analyzers or with cation conductivity which is a cumulative measurement of all contaminants in the sample. Why should I use a sulfate and chloride analyzer? Chloride and sulfate ions are highly corrosive and can cause pitting, stress cracking and other types of corrosion on boiler and steam generator tubes and turbines. The increased cycling conditions of power plants associated with the need to compensate for the unpredictability of alternative energy sources, makes them more susceptible to air intrusion which can aggravate corrosive conditions. Because frequent cycling leads to more corrosive conditions, steps need to be taken to enhance chemistry control with meaningful analytical measurements. Ion detection analyzers such as the 3000CS Analyzer offer significantly more relevant ion specific results than cation and degassed cation conductivity measurements to allow rapid monitoring and control of cycle chemistry. How does a chloride and sulfate analyzer work? A batch of the sample water is injected into a microfluidic capillary cartridge along with a set of reagents. On application of electricity, the chloride and sulfate ions in the sample start moving towards the anode in the cartridge and are separated as they travel through the capillaries. The separated ions pass through a conductivity cell in the capillary and the corresponding concentration of the ions is calculated from the conductivity measurement. The 3000CS analyzer provides on-line ppb-level detection of chlorides and sulfates in water cycle chemistry to control corrosion and minimize damage. The 2300Na Sodium Analyzer provides assurance of water purity to maximize water production and minimize corrosion. The 2800Si silica analyzer is a reliable, on-line instrument designed specifically for pure water treatment and power chemistry. Monitoring silica contamination is important to protect equipment and ensure heat exchange efficiency. It is particularly important in cogeneration applications where both the heat and water cycle are being used within the plant. Silica monitoring is a critical step in avoiding unplanned downtime, and an analyzer with trace sensitivity offers significant benefits. Find out how silica measurement works in this application note. Chloride and sulfate are the most corrosive ions in the water/steam cycle in a power plant. Typically monitored through sample testing, they can now be monitored on-line and in real time. With monitoring and control of chlorides and sulfates you can reduce pitting, stress corrosion cracking and other corrosion mechanisms that can damage expensive power components, reducing unplanned shutdowns and maintenance costs. This technical white paper outlines improvements to sodium measurement technology for on-line, water cycle chemistry applications, with a specific focus on the power industry. Highlighted in the paper are advances in the combination electrode, how modern sodium analyzers minimize reagent consumption and how automated calibration methods save operator time. The Process Analytics catalog includes product features and specifications, benefits and recommended application areas for the wide range of parameters which METTLER TOLEDO measures including: pH/ORP, conductivity, turbidity, dissolved oxygen, dissolved carbon dioxide, gas analytics, total organic carbon, sodium, silica and microbial contamination. It also highlights the transmitters and housings that are needed to make an entire measurement system. Corrosion from chloride and sulfate ions under high pressure and temperature conditions is a serious issue for power plant turbines. METTLER TOLEDO Thornton's 3000CS Analyzer offers on-line measurement of chloride and sulfate ions at ppb levels and helps power plant personnel monitor water cycle chemistry to control corrosion and minimize damage. With trace level detection, the 3000CS allows power plant operators to take preventative action against corrosion before it causes unplanned shutdowns, generation loss, and costly repairs. Sodium is responsible for corrosion in high-value turbine blades and other parts of the cycle. Early detection of contamination allows time for planning corrective action before condenser leaks enlarge and serious damage occurs. Sodium is a key parameter for monitoring pure water treatment system performance and for detecting contamination within the thermal cycle. 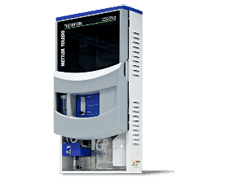 The METTLER TOLEDO Thornton 2300Na Sodium Analyzer provides efficient and reliable monitoring of low sodium concentrations for these applications. This video shows how the 2300Na Analyzer uses industry proven technology for measuring sodium, and adds innovative enhancements that simplify calibration and improve measurement reliability. The presence of silica in boiler feedwater can very quickly lead to deposit formation in turbines. As it can only be removed during out-of-service cleaning, preventing silica from entering the water cycle is the best course of action. 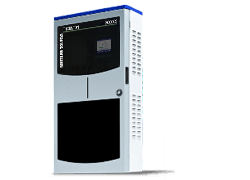 The 2800Si Silica Analyzer not only quickly detects trace-level contamination, the unit calibrates itself automatically, saving valuable operator time. 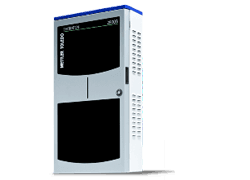 The METTLER TOLEDO Thornton 2800Si Silica Analyzer is a reliable on-line instrument designed specifically for pure water treatment and power cycle chemistry monitoring. Learn more about it in this video.